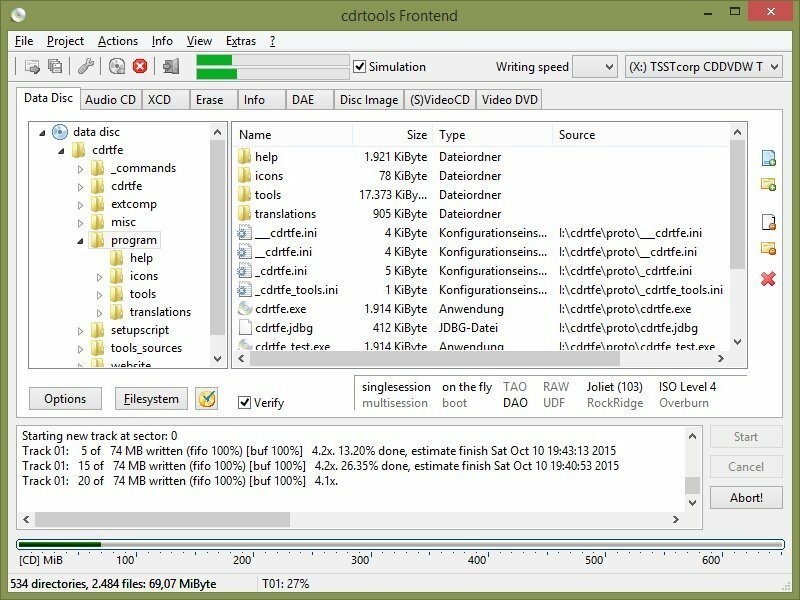 cdrtfe (cdrtools Frontend) is a collection of CD/DVD/BD tools for burning and audio extraction. In addition to standard data recording, the program includes support for media container formats like XCD, (S)VCD and DVD-video, audio formats (redbook), CD-Plus mixed format (audio+data) and creation and writing of ISO images and bootable discs. The program can also create CDs that "overburn" and add up to 13% more data than normal discs. Audio extraction formats include WAV, MP3, OGG, FLAC and more. The program is a front-end that combines several burning tools including cdrtools (cdrecord, mkisofs, readcd, cdda2wav), Mode2CDMaker and VCDImager. Also available in PortableApps format and in winPenPack format. How to extract: Download the "portable" self-extracting EXE and extract to a folder of your choice. Launch cdrtfe.exe. cdrtools updated to version 3.02a09. GUI, dialog for selecting multiple writers: CTRL-A selects all available writers. Thanks for that...and just in time. You seem to be the only one with that crucial piece of information on the whole web. I just figured it out.. At the bottom of the Data CD tab, right click on the bar that shows the CD's capacity, and you can switch the capacity to DVD capacity. Absolutely bizarre GUI choice! n response to Helge: The website says that, but the tool itself only shows a tab for Video DVD. There is a tab for Data CD, but no tab for Data DVD. I am extremely glad I found cdrtfe for one single but crucial reason: I need to burn audio-cd's with NO GAP between tracks. CD/DVD burners. Some of them are good. Now I use only ImgBurn. portable, it leaves traces in c:\Documents and Settings\Application Data\ImgBurn, but I think that is not a big issue. In response to User: I don't know if the description has been changed in the meantime, but on the website it says "[...]It can burn data discs (CD and DVD), Audio CDs, XCDs, (S)VCDs and DVD-Video discs[...]" - including data DVDs! A complex and confusing CD burner program that offers a stunning number of features, formats, and capabilities for only 8 megs. With an odd and confusing program interface, cdrtools will require an at least basic familiarity with different formatting settings or a good look at the provided help file. Conspicuously absent in a long list of features is the ability to burn data DVDs, only Video DVDs. This missing feature of any burner program (almost all present here at PortableFreeware.com) is big missing piece for users that want just one or a do-it-all burner program (DeepBurner is close). Works more reliably with my goofy USB Micro Solutions CD-R/W drive (housing a Mitsumi CR-48XATE) than Micro Solutions own s/w. Super! @Machete: Add 'PortableMode=1' to the section [General] of cdrtfe.ini. Then the program will only create files or folders in the folder from where it has been started. @Bryce Dayton: Normally, cdrtfe should start within seconds. Does it work, if you start it from hard disk? Please contact me via eMail (see readme_en.txt for address). Maybe it's just my somewhat unreliable 512mb flash drive, but this program seems to take an eternity to start and makes my whole computer lag while it's doing it.